Year-end and a new commuting challenge! It's only been two months since my token post about baggage, or whatever that was... so, I figured it was good time to wrap things up for 2016, and put a big fat bow on things. Life has been busy, however, I've managed to get more miles than lat year... and the year before that, which honestly surprised me. More indicative of business, perhaps creativity or focus, blog posts have been down. For 2014 I ended up with sixty-five (65) posts in total, while 2015 closed out with forty-one (41). While total posts has never really been a goal, there's no denying that I'm a numbers guy, by profession and practice as well as by nature; so, as I write this, only the seventeenth (17th) post of 2016, it's clear from where my attentions have shifted. I've had plenty to write about, but, even if I consider the five ride reports I effectively lost when a computer issue deleted my backup of a massive post I've been working on in October, the resulting total would barely be half of what 2015 brought in terms of content. The fog, however, may be lifting. Social media is a bit hollow and I rarely have less than 140 characters to say about anything, so, perhaps the "lost art" of the blog will return with some energy behind it for 2017. I wouldn't count on it, yet; time remains precious, and I'm about to return to school in addition to the two jobs I've managed to hold. I don't stop. Neither should anyone. Enough about that. Well, hell... if nothing else, follow me on Instagram, eh? A picture is worth 1,000 words, so maybe THAT's where the creative energy has been landing this year. Blogging is dead, after all. Meh. 'Evs. It's fun being weird... you should try it sometime. One worthy challenge is looming, however,and it returns this blog to it's original design intent... commuting to work, and how to do it. I've had it fairly easy in the sense that commuting to work has been almost a non-thought process with regards to what I have to work with at the office. I've been enjoying a cubicle-based existence ... which, trust me, is ONLY good from a commuting perspective for a lot of folks... but, one tends to take the space they have for granted until it's taken away. 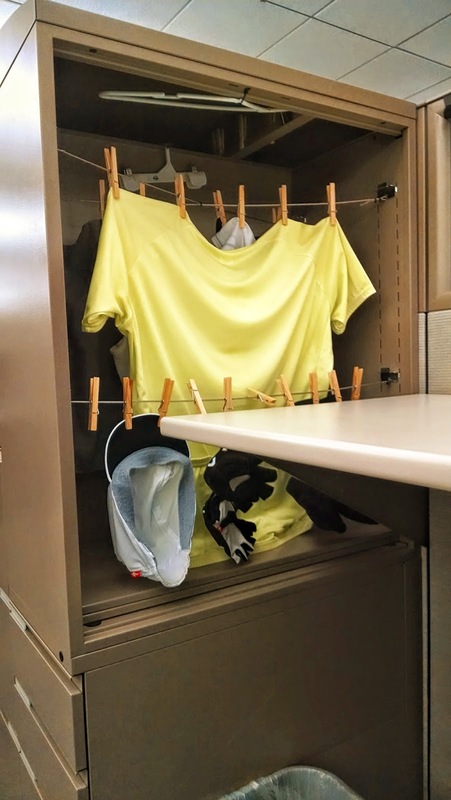 Yes: ample drawer space, overhead bins, and a literal upright bookshelf/cabinet arrangement that has served me well for hanging up layers for drying after the morning ride. All of that, thanks to an office modernization and minimalism project, is going bye-bye. Now what? Honestly, our old cubicles were MASSIVE, and even in "horde-mode" I couldn't fill it. I personally think it's cute that I only had ONE computer monitor at this point in my career. I've already gone through the range of emotions and have landed on acceptance, because - honestly - it's not THAT big of a deal. The alternatives could be a forced work-from-home policy, or yeah.. no job at all. What am I REALLY complaining about, right? Yeah, I'm not. In the same cubicle as above, but out of frame to the left... A BOOKSHELF cabinet with drawers!? Re-purposed shelf supports, some speaker wire, clothes pins and zip-ties = commuting ease! . . .but, not any more, in just a few short months. I'm not complaining... because, honestly, we haven't needed this amount of space for years now... it all makes good sense; but, it adds a layer of challenge considering I've taken this sort of accommodation for granted. But, it does remind me a lot of when my primary job was at a much, much smaller desk space, with practically no drawer-space and no overheads or spare cubes to string clothes-lines across. Heck, at the bike store - something I didn't really think about - there was almost NO available space to dry clothes, because there was no concept of "desk" anywhere! People do this, every day... and since I've already decided that this is not going to prevent me from being a responsible citizen and active commuter, I, too, will find a way to adapt. Documenting it, however, it the next step - and it will have the effect of revitalizing this blog a bit. Things I haven't had to think about for over a decade will become new challenges to overcome, and - who knows - maybe it will help someone out there who isn't quite sure how to get started with commuting to work by bicycle to their office. No matter how limited or cramped - this IS possible. It's time for me, once the final office space is complete, to adapt once more and keep moving forward. One solution, just NEVER change out of my riding clothes! Problem solved! Customer meetings are for chumps! on a commute to work, right? So, stay tuned... as the "drama" unfolds, so will updated and new pics on how to adapt. It's going to be interesting, and I already have some ideas that my new, close-by neighbors in the new work-space will SURELY love and adore. Riiight... time to stock up on deodorant, and re-examine the "shower-only" office gym membership (speaking of things I shouldn't take for granted). In other news, time to start back on the holiday season diet and get back on the bike. I enjoyed a terrific 100km flyer with Steven W. a few weeks back, clocking an ALMOST personal-best (the only problem being the post-paid receipt nature of the last control); hey, considering how I've been my own worst enemy when it comes to riding pace, "training", staying on top of my fitness and diet, I'm LOVING the fact that I was able to knock out that pace! Anyhow... not bragging, just trying to be the best version of myself I can. More on that, and more ride reports to come in the new year. Until then, happy holidays to everyone! I'll be back.... bet on it.